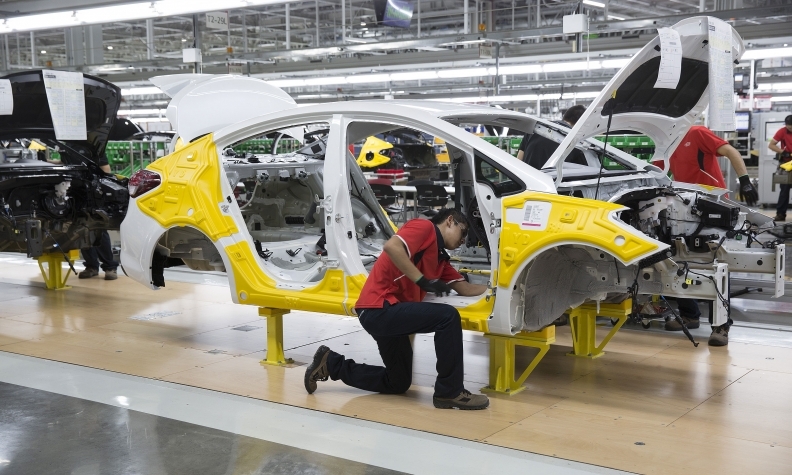 A Kia assembly plant in Mexico. U.S. content in automotive imports from Mexico declined to 18.1 percent in 2011 from 26.5 percent in 1995, the Commerce Department said Friday. WASHINGTON -- Seeking to bolster its case for tougher rules of origin in the North American Free Trade Agreement, the Trump administration released a new study on Friday that shows U.S. value-added content is declining for manufactured goods imported from Mexico and Canada. The Commerce Department analysis of recently released OECD trade in value-added data found that U.S. content in automotive imports from Mexico declined to 18.1 per cent in 2011 from 26.5 per cent in 1995. U.S. content in automotive imports from Canada declined to 26.4 per cent from 34.9 per cent over the same period. At the same time, automotive value added content from non-NAFTA countries in Mexican auto imports rose to 29.5 per cent from 13.2 per cent. China has seen the fastest growth in that component, to 5.8 per cent in 2011 from a scant 0.3 per cent in 1995. U.S. Commerce Secretary Wilbur Ross has frequently criticized NAFTA's rules of origin as a "back door" for Chinese auto parts to enter the United States through Mexico and Canada and that the trade pact's benefits needed to be restricted to its members. The report comes as chief U.S. negotiator John Melle prepares to present new text proposals at the third round of NAFTA talks in Ottawa starting on Saturday, where he said "more challenging issues will start taking center stage." These are expected to include rules of origin, a chapter in which the Trump administration wants more substantial U.S. content in autos, the main source of the US$64-billion trade deficit with Mexico and the US$11-billion deficit with Canada. "If we don't fix the rules of origin, negotiations on the rest of the agreement will fail to meaningfully shift the trade imbalance," Ross said in an opinion piece about the study published in The Washington Post. The administration has not yet revealed its rules of origin targets, but some auto industry lobbyists and executives expect the Trump administration to seek a regional automotive content requirement of 70 per cent or more, and a U.S.-specific content requirement of at least 35 per cent. Overall, the study found that the U.S. content of manufactured goods from Canada dropped to 15 per cent in 2011 from 21 per cent in 1995, a year after NAFTA went into effect. The U.S. content in Mexican manufactured goods fell by more, to 16 per cent from 21 per cent. At the same time, Ross said the study shows content from non-NAFTA countries was rising over the same period, suggesting the origin rules needed to more tightly restrict NAFTA access benefits. Mexican officials have said that Mexican imports into the United States contain an average of 40 per cent U.S. content, arguing that the United States benefits from stronger economic integration with Mexico. "These data debunk the claim that U.S. content in the form of parts is so high that we shouldn't worry about headline gross-deficit figures," Ross said in his op-ed. The study also singled out rising non-NAFTA content in basic metals imports from Mexico and Canada, pointing to possible demands for tighter origin rules governing these products.